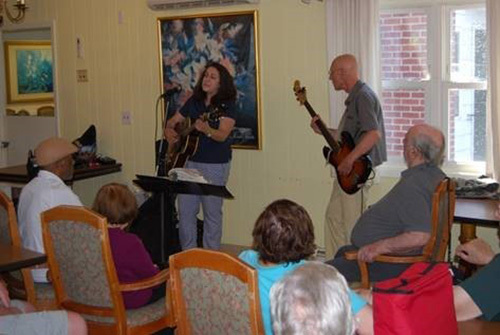 The members of Nina Et cetera perform a collection of classic jazz, folk, country and soul music for the residents and their families and caretakers, at Mc Peak's Assisted Living. On July 24, residents of McPeak's Assisted Living and their family members were treated to a special performance courtesy of Nina Et cetera. The duo played a one-hour set featuring a variety of jazz, blues, folk and country-western standards. During the performance, residents enjoyed a delicious summertime snack of ice cream and beverages.